Many college hockey programs finished their seasons this week, which means it’s entry-level contract time and all NCAA players are free to sign pro-level contracts. In most cases the player would sign with the team that drafted him and team get assigned to an AHL affiliate. When it comes to undrafted players, they have the option to sign with any team that makes an offer. Just take a look at what Pittsburgh does every March. The Penguins never back away from NCAA players in the draft and on the free agent market. Last season, Pittsburgh signed coveted Northeastern University forward Zach Aston-Reese. He was immediately sent to the AHL but was given the opportunity to play this season, totaling 6 points (4G, 2A) in 10 games before he got hurt last month. They did the same with Connor Sheary after his senior season at UMass-Amhert wrapped up in 2014. See Thomas Di Pauli and Ethan Prow for a couple more examples. We suggested this last year, and it didn’t happen, but that’s not going to stop us from suggesting it once again this season. Here are a few defenseman that could help the Golden Knights organizational depth. Remember, Vegas splits an AHL team and they need more bodies in the system. If Vegas is concerned about the lack of depth on the blue line, they could target the highly skilled Goransson. The Swede is effective shutting down forwards, moving the puck and starting rushes. Mostly he’s a stay at home defenseman, and scouts rave about Goransson’s gap control. Opposing players mention how aware they were of his presence on the ice. At 6’3, Goransson has NHL blueline size combined with NHL skill. If I were ever a GM, I’d take a risk on any Swedish defenseman. Keeper’s head coach at UMaine, called him an incredible two-way defenseman, and assistant coaches called him cerebral and decisive. A quick-moving defenseman with a quick-moving brain? Sign me up. The 21-year-old won’t be unprepared for the AHL as he totaled 76 PIMs this season. Vancouver is reportedly very interested in Keeper. I’m assuming other NHL clubs have reached out to his advisor as well. As for Vegas, it’s not normally the way they add depth, but Keeper’s skill set would fit their system nicely. Plus, he’s a right-handed defenseman. The Golden Knights only have two, Colin Miller and a 35-year-old Deryk Engelland. The school that produced undrafted free agent Brad Hunt, has developed another free agent ready for the pros. Whitecloud has been the most scouted undrafted NCAA free agent this season. He even got to meet Kings GM Rob Blake and Tampa GM Steve Yzerman at one of his games. 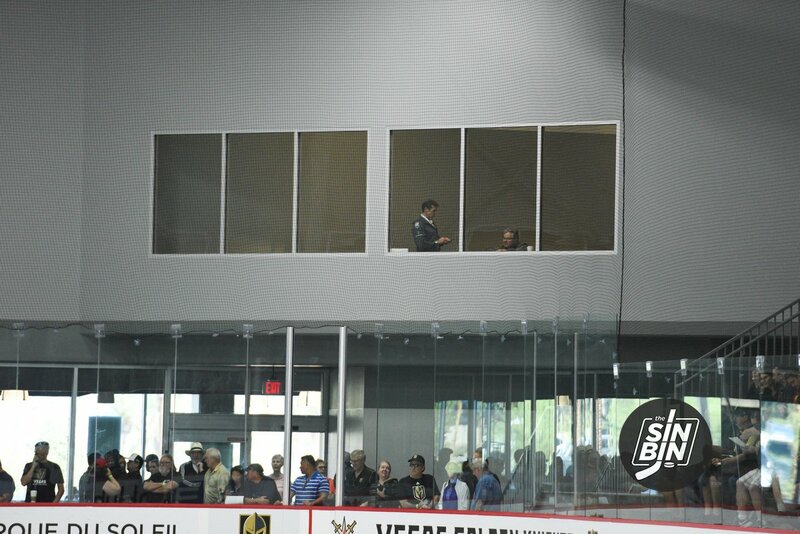 In fact, the amount of NHL scouts coming to Bemidji games became so ridiculous, the school had to set up new policies. Another element that makes Whitecloud an interesting case for the Golden Knights is his connection to Kelly McCrimmon. The native of Brandon, Manitoba had the opportunity to play for McCrimmon and the Wheat Kings a few years back. Whitecloud chose Bemidji over the WHL because he didn’t want to lose his college eligibility. Considering he’s about to land a pro entry-level contract, taking the free college education was a smart decision. Chances are McCrimmon knows everything he needs to know about Whitecloud. Possibly, he’s already reached out to his college advisor. Offensively, there are a few undrafted players getting attention from pro clubs. However, defensively Goransson, Keeper and Whitecloud posses the skill, size, speed, and hockey IQ the Golden Knights look for. With so much uncertainty in this upcoming offseason, adding organizational depth through college free agency can’t hurt. Vegas is still building a franchise so there’s room for more players. And let’s face it, it’s one of the most desirable franchises to play for. So convincing them to play in the AHL for a season or two shouldn’t be tough. Good article but why would Daniel Brickley be excluded? 2nd in D scoring in nation and great size on a top 5 in the country. From articles I have read he is the number 1 target by the majority of the league. Yeah, Brickey would be nice. Maybe he was excluded because it’s likely Minnesota State’s season is going to extend about another month probably. One of the main reasons the pens have won back to back cups has been their ability to find good college players. Rust, Sheary, Guentzel and Reese have all come out of the college ranks. This allows them to trade their draft picks and stay under the cap. 750k entry level contract for a guy like Guentzel, 16g in the playoffs, is a pretty good deal for a cap top heavy team.